New 2015 Niche Rims: Project M093/M094, Surge M112/M114, Enyo M115, Misano M116/117, Citrine M155/M156/M161, Form M157/M158, Intake M159/M160, Invert M162/M163, Walker M091/M092. The new rims from Niche Road Wheels combine high-class performance and a wide variety of intriguing styles. This year’s wheels feature striking lines that will stand out on any vehicle, from the sturdy family standbys like Toyota to the exclusive luxury rides like Tesla. The range of finishes runs from classics like silver, to more unusual hues– bronze and dark-tinted machined faces that evoke mystery and boldness. The 2015 Niche rims offer styles for every taste, from classic and clean-cut looks like the Surge (M112 and M114), to the more fanciful and flashy Citrine (M155, M156, M161). There are two lines to choose from: the Sport Series and the Racing Series. Both collections are engineered to look great while handling anything the driver can throw at them, from serious work to not-so-serious fun– or even your daily commute. To see the new wheels and find the perfect ones for your vehicle: Niche Road Wheels. To get started on your way to adding these exciting new wheels to your vehicle, call our wheel experts at 1-800-232-0734. With a lifetime’s worth of combined experience between them, our wheel and tire fitment experts are ready and waiting to help you find exactly the right wheels for your vehicle– and they can help you pick the perfect tires to go with them. To show how confident we are, we guarantee the right fitment on your vehicle. 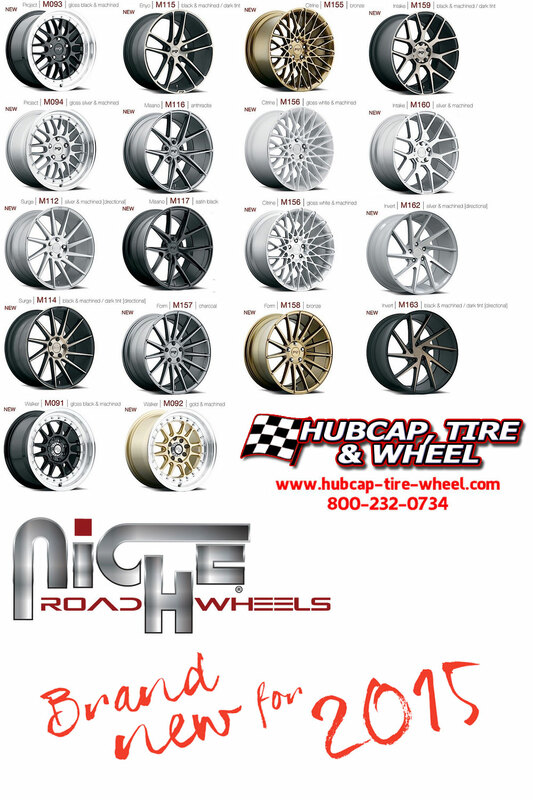 Please contact us at email@hubcap-tire-wheel.com and be specific of what wheels you are looking at, what vehicle they will be going on as well as a postal code on where they will be shipped to. Thanks!